Last week I found myself looking for lunch in the median dividing Pennsylvania Avenue. Eastern Market may have been around the corner, beckoning with blueberry buckwheat pancakes, but instead I was searching for my next culinary thrill amidst six lanes of honking traffic, under the watchful eye of the U.S. capitol building. 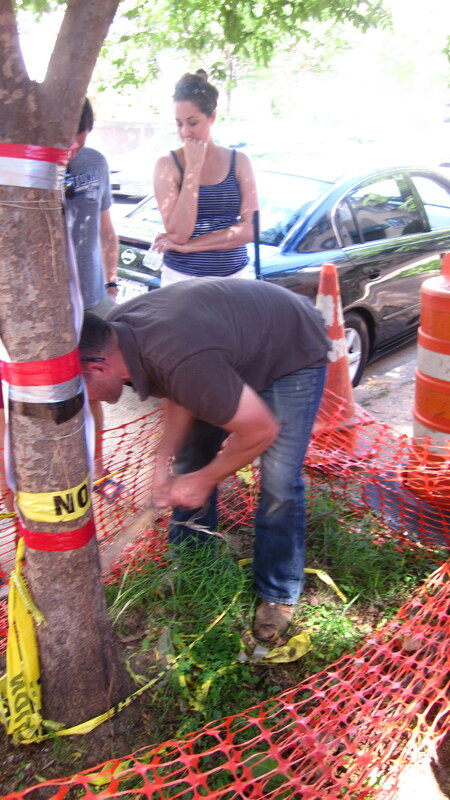 I was standing in the middle of the street, scanning a concrete jungle for green, because of Dr. Bill Schindler, an anthropology professor at Washington College. His research interest in prehistoric technology is matched by a remarkable commitment to everything-DIY (this is a father of three who bakes his own sourdough bread in a backyard wood-burning oven, drives to Pennsylvania from his home on Maryland’s Eastern Shore each week to buy raw milk to make his own yogurt, and cures all of his own meat, eating only animals raised by people he knows), making him a venerable authority on foraging. On this June Saturday, Dr. Schindler was leading an edible walking tour of Capitol Hill, winding his way through the neighborhood in pursuit of wild greens, mushrooms, and berries to later transform into lunch. 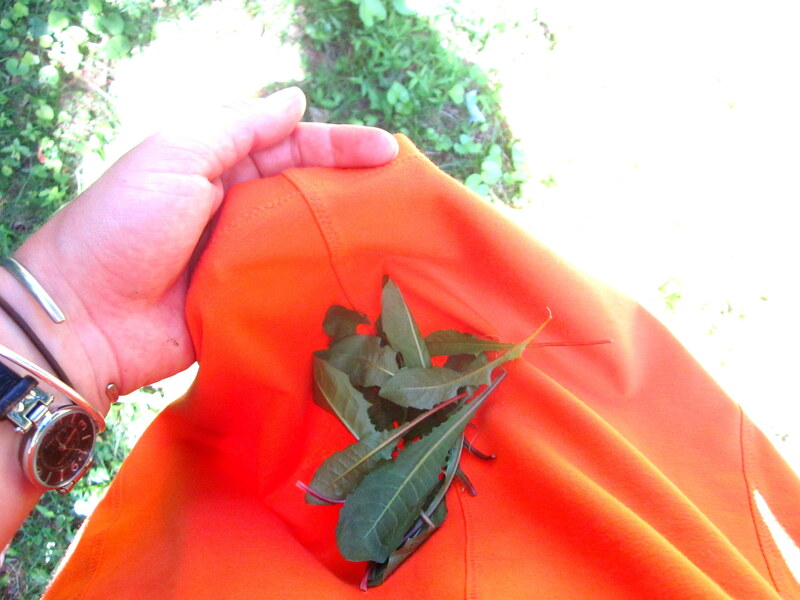 We collected bags of dandelion, purslane, and wood sorrel, dug up stalks of wild garlic and onion, stumbled upon Oregon grape, mulberry, and Kousa dogwood berries, picked poor man’s pepper, chickweed, and common mallow, and reached up to black walnut, ginkgo, and linden trees – all within a 6-block radius. Our urban world is surprisingly edible, depending on how you view it. Digging up wild garlic – no ground was off limits. 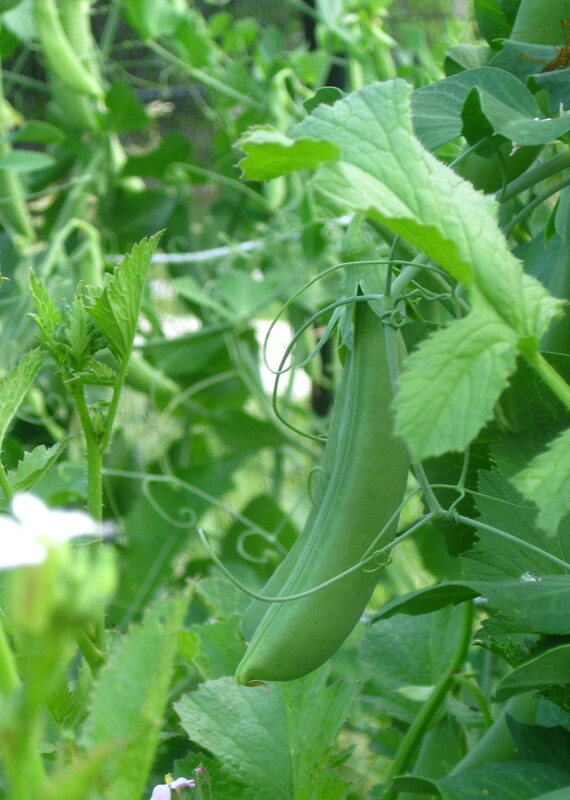 Looking for edible plants changes your perception of scale. 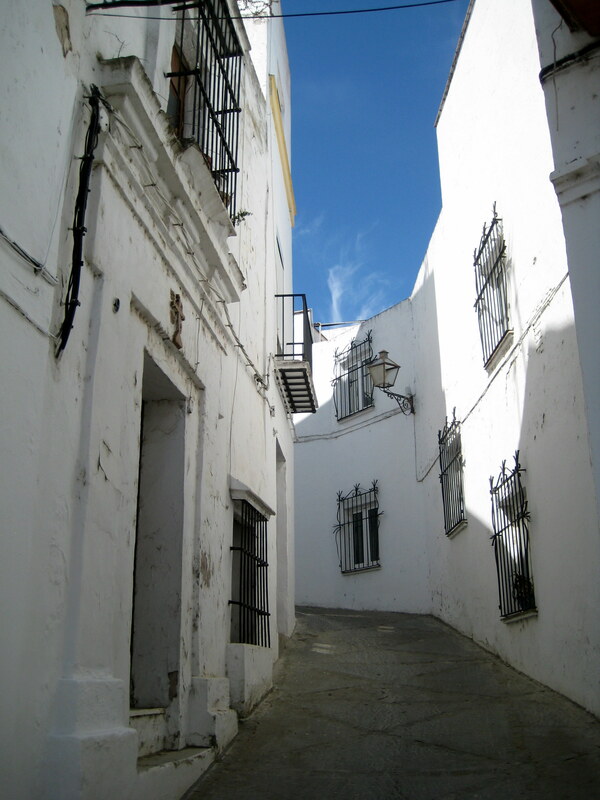 Under the shadow of imposing monuments and fortress-like institutions, you normally wouldn’t think twice about a spindly weed sticking out from a crack in the sidewalk, peeking at the constant stream of lawmakers and tourists. We’ve been enjoying the many waves of a dynamic food revolution, but all the hype to eat the newest Korean taco, our salivating over the novel and exotic, sometimes keeps us from looking down at what’s right in front of us – or even what we’re walking on. The wild foods that we try so hard to eliminate from our gardens or walk past without a second thought offer a host of nutrients – many of which have been lost from the foods we’ve been cultivating for generations – at no price (that is, if you’ve read up on things; once you dip your toes in mycology that price could be poison if you don’t have a good understanding of what you’re eating). 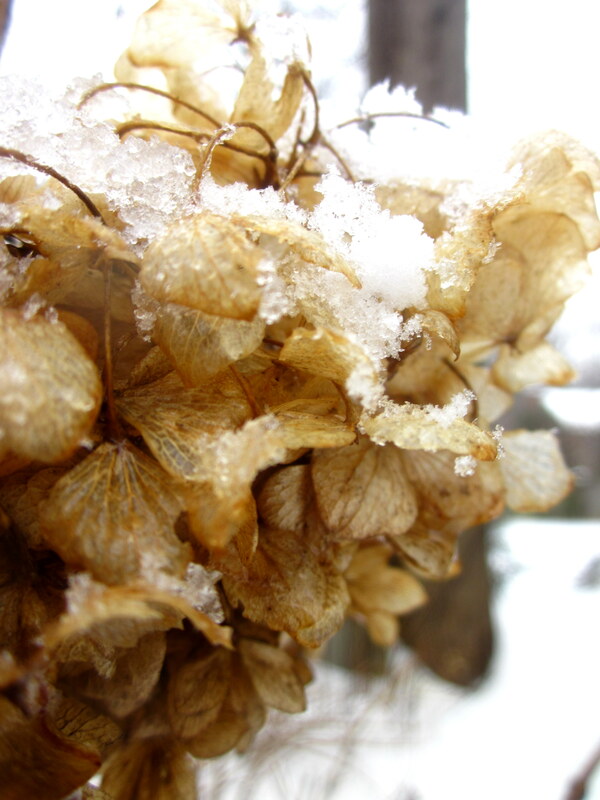 One viable concern with wild plants is the effect that any chemical contamination may have on the soil they grow in. 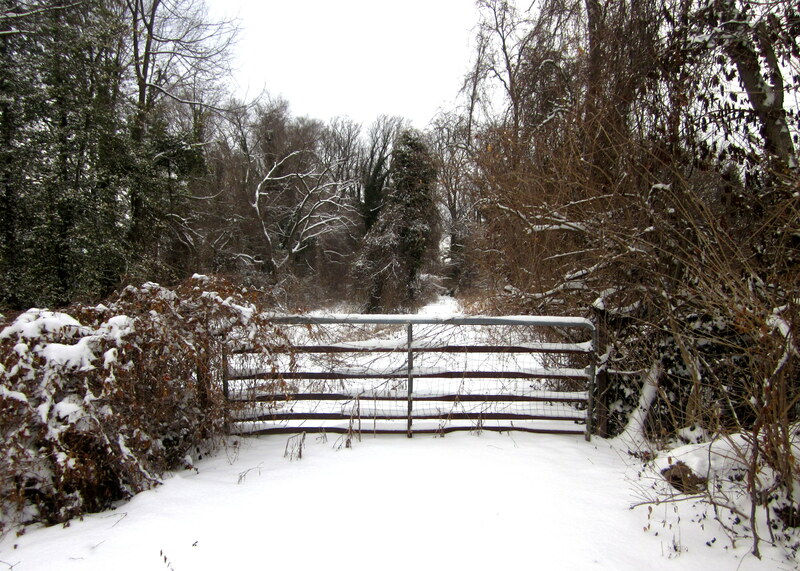 The best way to address this issue is to forage in areas you’re familiar with – know your neighborhood and its history. “But what about dog pee?” asks my mother. To this, I say you can wash what you pick and, honestly, you’ve probably eaten something worse without knowing it – going to any restaurant is an impressive exercise in trust that we accept as part of daily life. 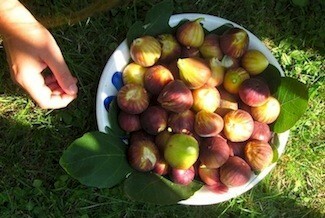 Foraging and the reactions it provokes say a lot about the psychology of food. Since the advent of the supermarket, we’ve been more comfortable knowing less about where our food comes from and where it’s been since, as if a blank page makes something clean. That attitude is certainly changing as the farm-to-table movement charges forward, but there’s still a widespread convention that food is grown within certain boundaries, either on farms or in the confines of gardens or containers. The structural anthropologist Claude Lévi-Strauss wrote about people’s understanding of “raw,” “cooked,” and “rotten,” describing how our definitions for these basic words varies across time and culture – one man’s rotten is another man’s dinner. The same goes for “wild.” Some people flock towards the fruiting ginkgo trees in Central Park, gathering up all the little yellow-orange spheres littering the ground, while others walk past, balking at the smell. Whether something is edible or not can be just as much a question of culture and socioeconomics as biology. As with most trends, foraging has also begun to transition from one end of the spectrum to the other, having been recently embraced by the world of fine dining, raising hunter-gatherer practices to a new level of chic. Look no further than René Redzepi’s Noma, a Danish restaurant relying on wild ingredients that are hand-selected from the Scandinavian landscape (see Jacob Mikanowski’s piece in The Point journal for a beautiful description). It’s been lauded as the world’s best restaurant for three years in a row, with eager diners flying halfway across the world for a dinner reservation made a year in advance. In this context, foraging is an art form rather than a survival mechanism, but it’s important to remember that it’s something that we can engage with in our own neighborhoods, local forests, and backyards. 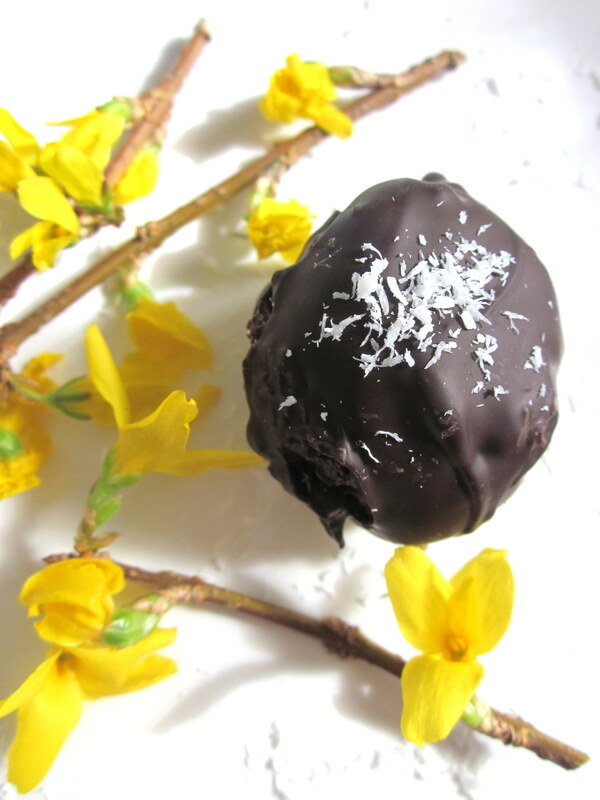 Searching for edible plants is addictive. Once you start paying attention to the edge of the sidewalk, narrowing your focus as you open your eyes, you’ll find yourself exclaiming at the sight of a recognizable tuft of green at every block. You don’t even need to go for a walk; here’s what I found in the backyard this weekend – all pretty foolproof to identify and easily stumbled upon in most regions. 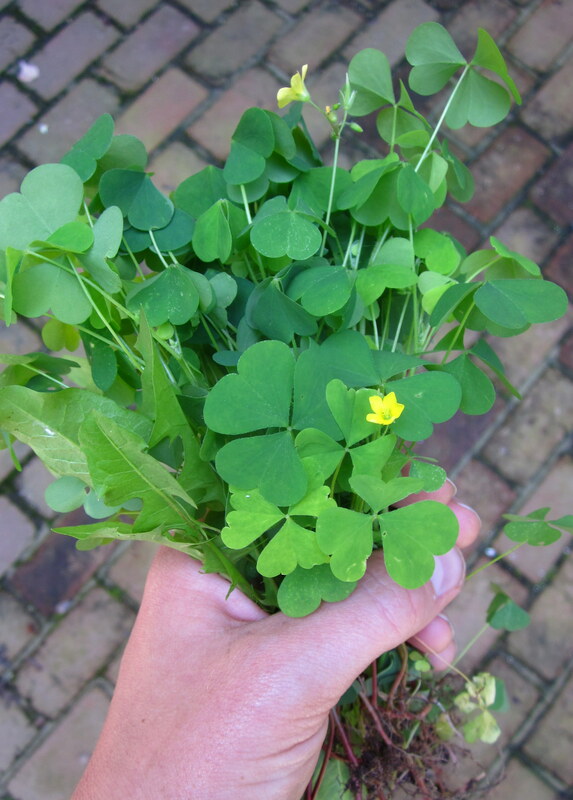 Wood sorrel: This plant looks like clover, but is silkier and more delicate, with bright yellow flowers. Centuries ago, Europeans would use this as a substitute for lemons when citrus was inaccessible, since it offers a similar bright, acidic taste. It can be eaten cooked or raw, though it turns an unappealing brown-green color when cooked so I prefer to combine it with other greens in a sauté pan, or use it raw as an herb or addition to salads. 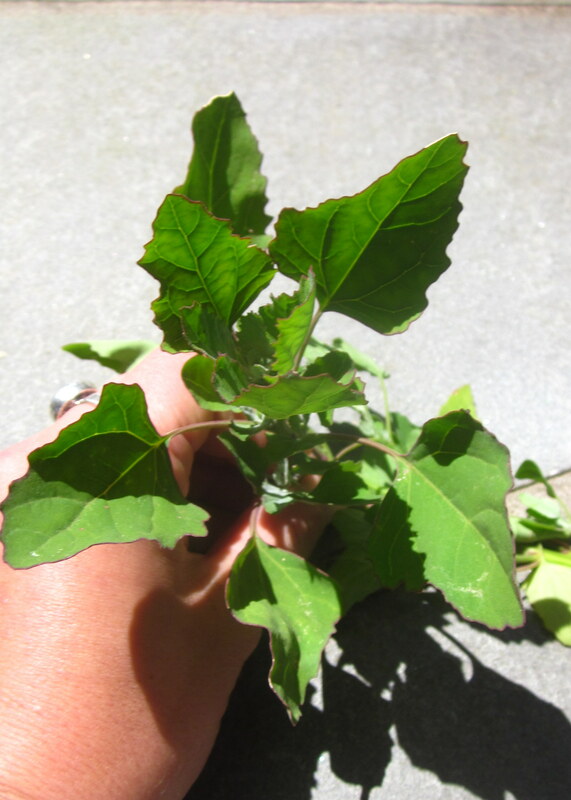 Lamb’s quarters: This plant is also known as wild spinach, pigweed (because it was fed to pigs), and goosefoot (because of the shape of its leaves – I agree that it looks more like a goose’s foot than anything related to a lamb). Lamb’s quarters were eaten, both in raw and cooked form, by Greeks and Romans long before Arabs carried spinach over to Europe. 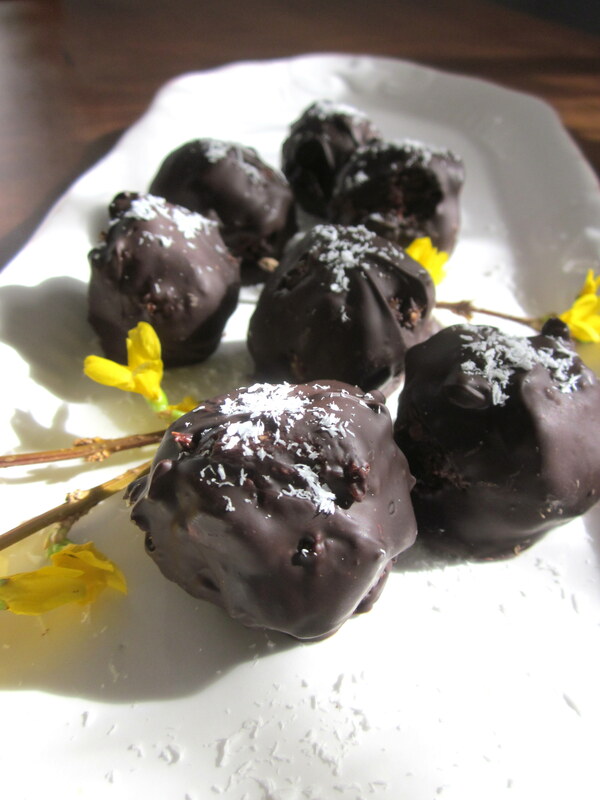 Dandelion: This ever-present weed is becoming more popular at stores and markets. 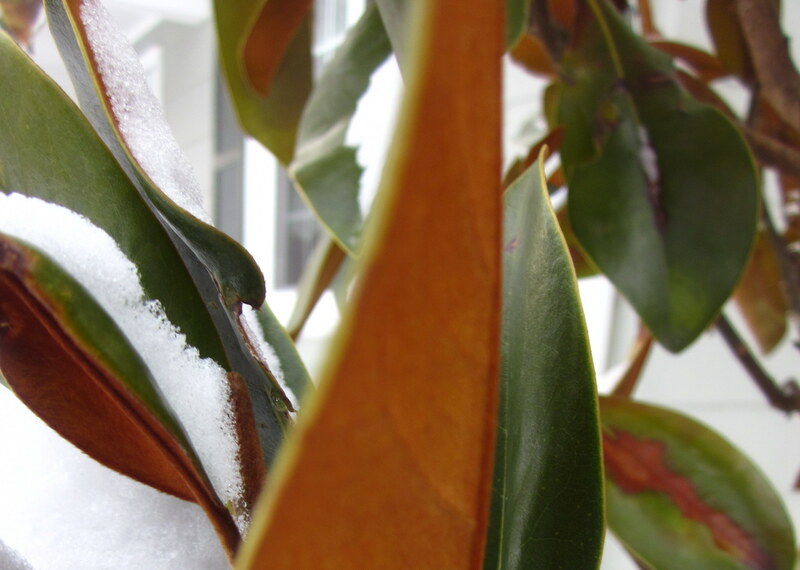 Look for smaller, tender leaves. When picking through edible plants, trust your sense of touch: tough, gnarled leaves will likely have a harsher taste, while younger, more delicate ones will only have a slight bitterness, which lends itself well to creative uses in the kitchen. 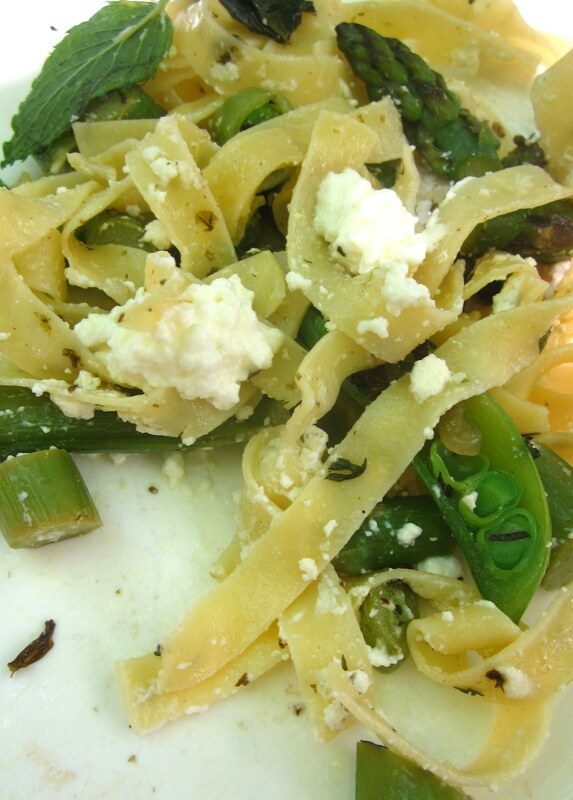 Snap peas have been falling off the vine in the garden lately, so I added them to my backyard collection, figuring they would be a good sweet counterpoint to the wild greens, and then decided to toss everything together with pasta, asparagus, and ricotta cheese. 1. 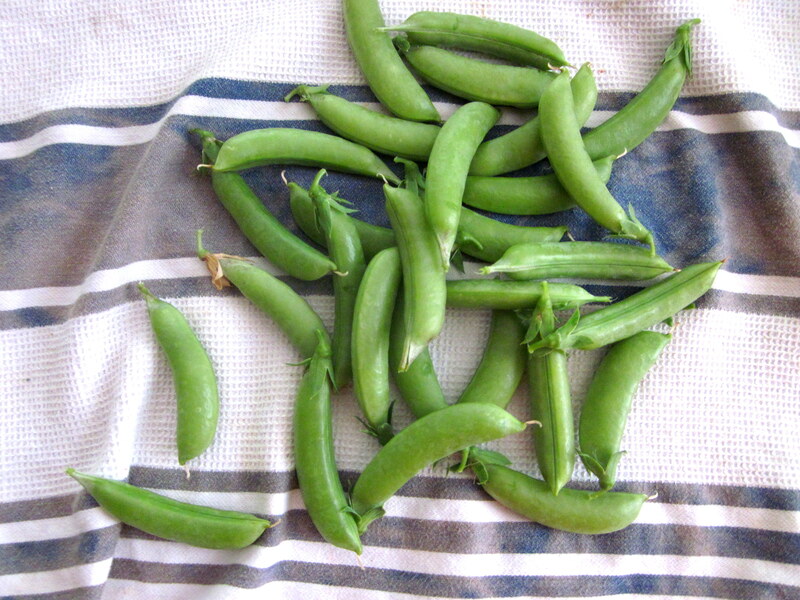 Blanch the peas and asparagus: Bring a pot of salted water to a boil. Meanwhile, prepare a large bowl of iced cold water and trim the asparagus stalks. Drop the asparagus and peas into the pot and cook for about 2 minutes before draining. Immediately transfer the peas and asparagus into the ice water bath to stop the cooking, then drain. 2. Cut the asparagus into bite size chunks and the snap peas to your preference – I left some whole, sliced some in half, and removed the peas from others, chopping up their pods. 3. Bring a pot of salted water to a boil for the pasta. As you wait, heat a few glugs of olive oil in a large skillet with the chopped shallot. Add the wild greens, peas, and asparagus, and season with salt and pepper. Sauté for about 5 minutes. 4. Once the pasta water boils, add the tagliatelle, stirring to prevent the pasta from sticking together, and cook for about 3 minutes. When the pasta is just shy of al dente, transfer the tagliatelle to the skillet using a slotted spoon, continuing to heat the sauce under medium-low heat. It’s not only OK that some pasta water makes its way to the skillet, it’s actually preferable – starchy, salted pasta water thickens the sauce and helps it adhere to the pasta. It’s good to get in the habit of reserving a half of a cup or so of pasta water before draining the contents of your pot because it’s an easy way to smooth out the sauce at the last minute. 5. Add dollops of ricotta and torn fresh herbs to the pasta, and stir to combine. Add more salt and pepper to taste, and finish with a drizzle of olive oil. Serve with extra ricotta on the side. Holding a dead octopus has got to be one of the strangest sensations. It’s humbling to feel its slippery weight in your hands and imagine what it must have looked like in the sea: an otherworldly creature propelling itself through the water, tentacles curling and flexing with graceful force. There’s something both terrifying and thrilling in the way the suction cups stick to your hands, releasing with a little pop – like the octopus still thinks it’s clinging to a rock deep in the ocean, even though it’s miles away, dangling above your kitchen sink. Uprooted from its underwater kingdom, an octopus may look like a deflated version of its previous self, its color a muted gray-purple, its tentacles hanging limp. But simmering in a pot of water has a transformative effect. In a sort of stovetop alchemy, the slow-bubbling water restores firmness to the octopus’ flesh, bringing out the vibrant purples and pinks in its skin and coaxing its tentacles into playful spirals. 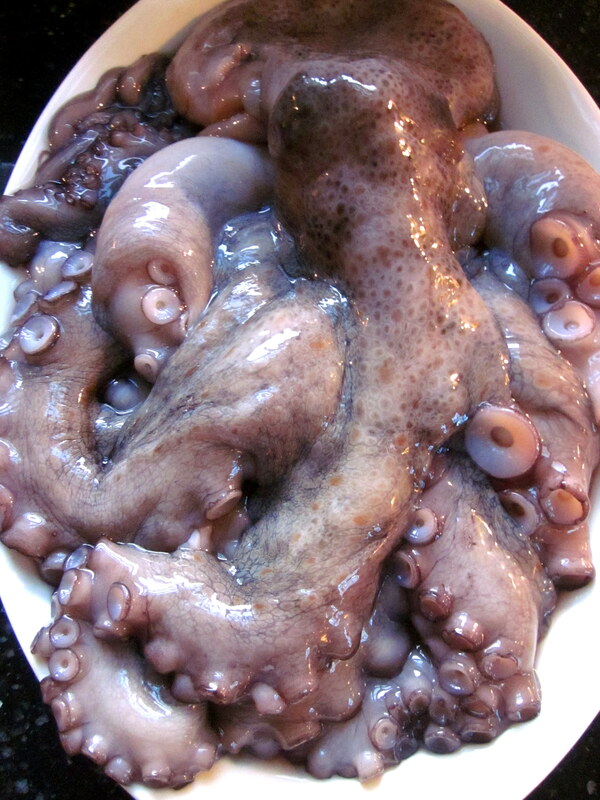 Mediterranean and Asian cultures, particularly Japan, have long mastered the art of cooking octopus. And it truly is an art: simmering long enough to allow the meat to become tender, with a slight chew, but not so much that it tenses up and turns rubbery. Traveling around the world, you’ll encounter different tricks to achieving this treasured consistency. 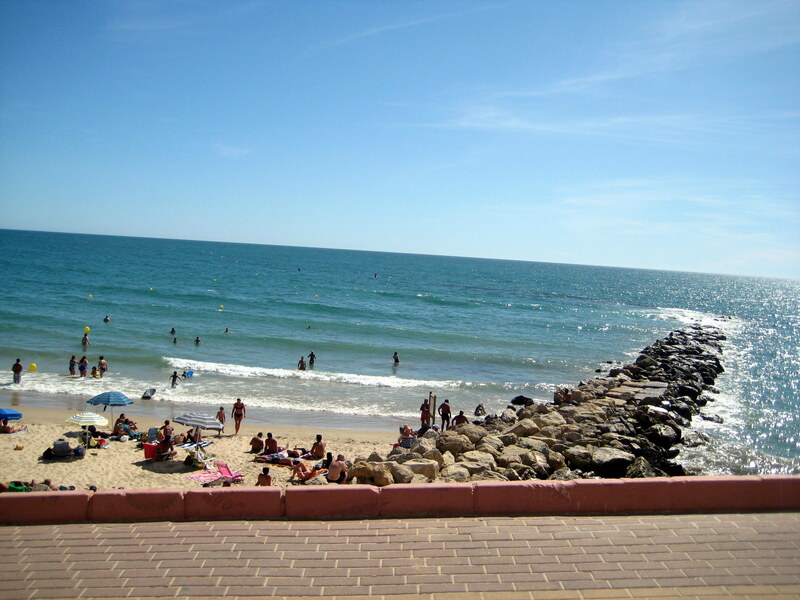 In Greece, Portugal, and other Mediterranean countries, people whack the raw octopus against ocean rocks. Japanese cooks, on the other hand, rub the flesh with grated daikon or salt. Italians add a wine cork to the boiling water, since cork contains an enzyme that helps tenderize meat. Lidia Bastianich, a dependable authority on Italian cooking, recommends one cork for every two pounds of octopus. In Spain, the octopus is dunked in boiling water, tentacles first, in three short bursts before being completely submerged. Spaniards also cook the octopus in copper kettles since the chemical reaction between the metal and flesh lends a reddish color to the skin (if you want this effect but don’t have a copper pot, you can also toss a penny into the mix). 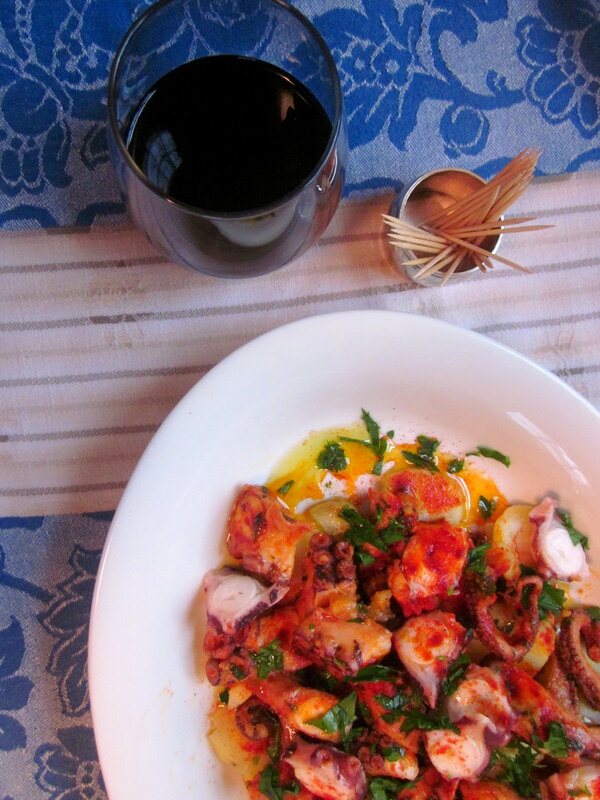 Perhaps the most celebrated of octopus recipes is pulpo a la gallega, or Galician-style octopus. It’s a dish that you’re bound to find as part of a tapas spread: pieces of octopus laid over a bed of golden potatoes, glistening with olive oil and covered with a dusting of brick red Spanish paprika. Its charm lies in the way it manages to be comfortingly rustic and irresistibly exotic at the same time. 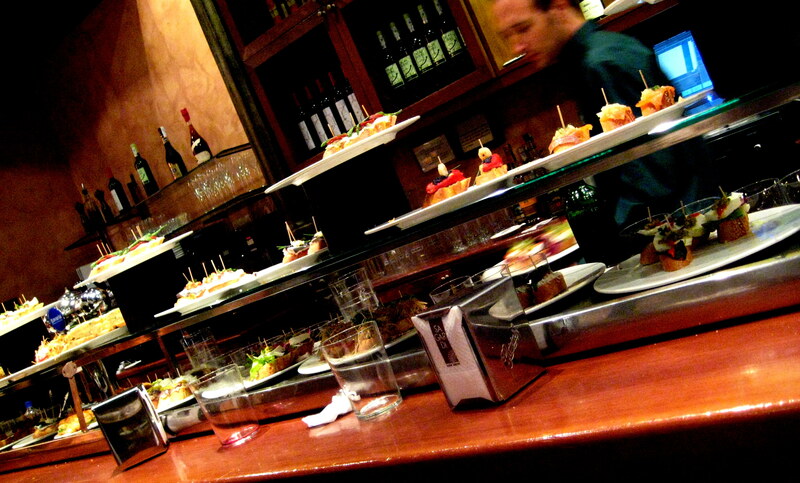 As its name suggests, pulpo a la gallega comes from Galicia, an area in the northwest corner of Spain. 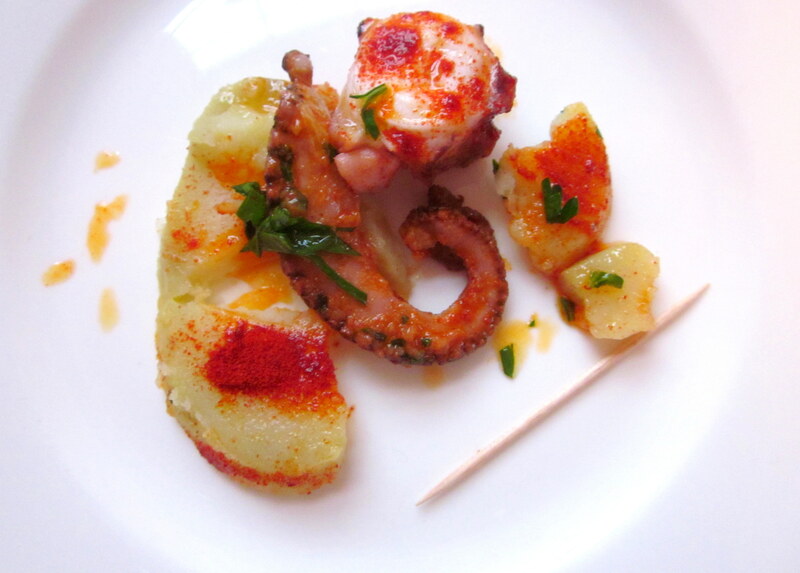 In Galician, a combination of Spanish and Portuguese languages, the dish is also called polbo á feira, or fair-style octopus, since it is the centerpiece of a rich tradition of October festivals honoring Saint Froilán, an important saint in the region’s history. During these celebrations, women called polbeiras (literally, “octopus-cooking women”) simmer octopus in huge copper cauldrons and serve it alongside cachelos, boiled potatoes, on traditional wooden plates. Even without a big copper pot, making pulpo a la gallega is surprisingly easy and yields impressive results – a plate full of bright colors and salty-smoky flavors. With the recipe below, I’ve deviated a bit from Spanish traditions and Italianized things by using the wine cork method. A note on sourcing an octopus: the prospect of finding good fresh octopus may seem daunting, but don’t despair – often it’s actually better to buy a frozen one. Chilled shortly after it’s been caught, a frozen octopus usually promises greater freshness than one that has been sitting around in seafood displays for several days (just defrost the day before you cook). Either way, avoid anything that smells like fish. The octopus will usually come already cleaned; all you have to do is remove the “beak,” located at the bottom-center of the skirt, with a knife. 1. Bring a large pot of salted water to a boil. In the meantime, rinse the octopus under cold water. 2. 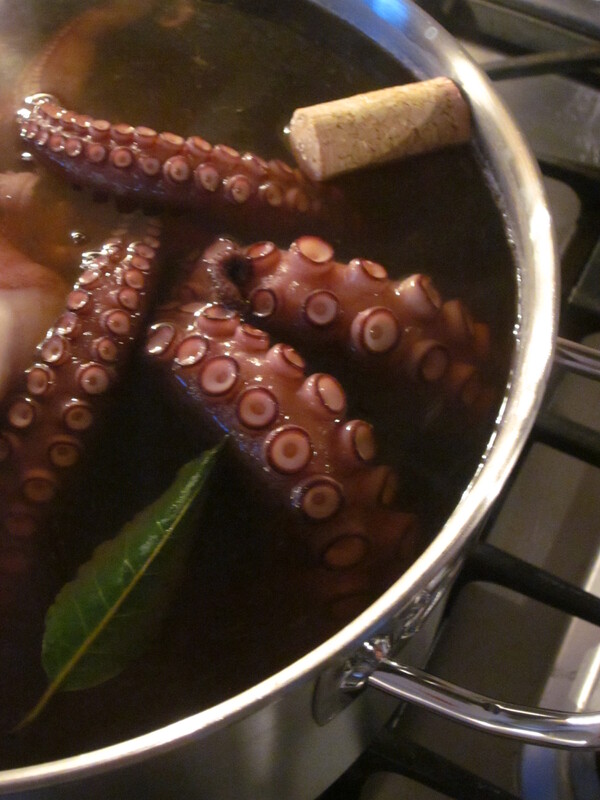 When the water boils, submerge the entire octopus in the water, and add the bay leaf and wine corks. Bring the water back to a boil, then reduce the heat slightly to allow the octopus to cook at a medium simmer. 3. Let the octopus cook for 45 minutes to an hour, depending on its size. You’ll know the octopus is done when you can pierce it easily at its thickest part, the skirt area, with a knife – just like a potato. About halfway into the cooking time, add the potatoes to the same pot. 4. When the octopus is tender and the potatoes are done, turn off the heat and let them sit in the pot. Meanwhile, chop the parsley. 5. After about 15 minutes, drain the contents of the pot, discarding the bay leaf and corks. 6. Slice the potatoes into thick rounds (about ½ inch) or large chunks and place on a serving plate. Sprinkle with salt. 7. 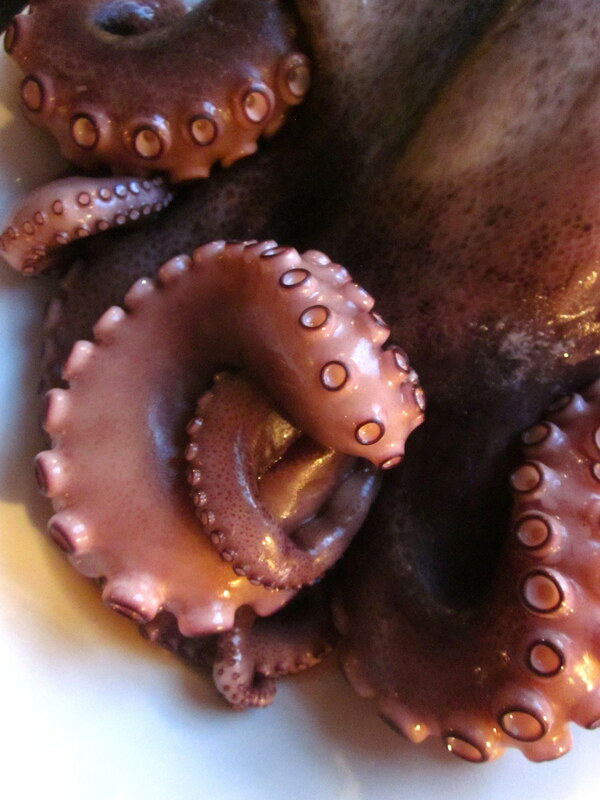 With a pair of kitchen scissors or a sharp knife, cut the octopus tentacles into medium pieces. 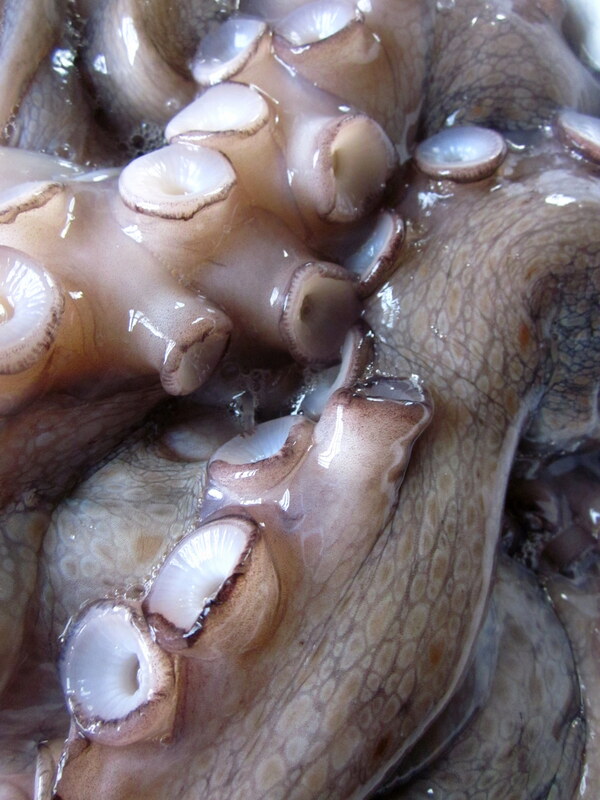 Chop the octopus head into bite-size chunks – though this is optional, since some do not consider the head as flavorful as the tentacles. Arrange the octopus on top of the potatoes. 8. 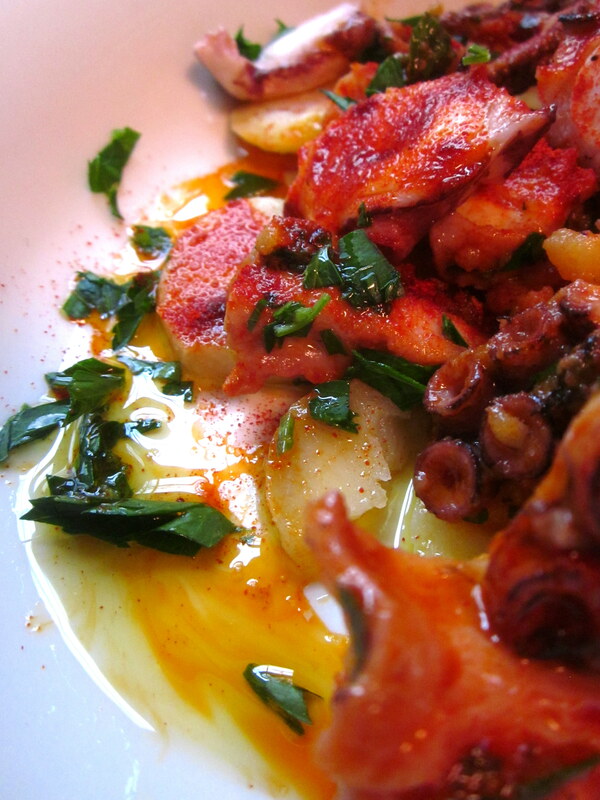 Using a spoon, liberally dust the octopus and potatoes with the pimentón, then season with salt and dress with a generous pour of olive oil. 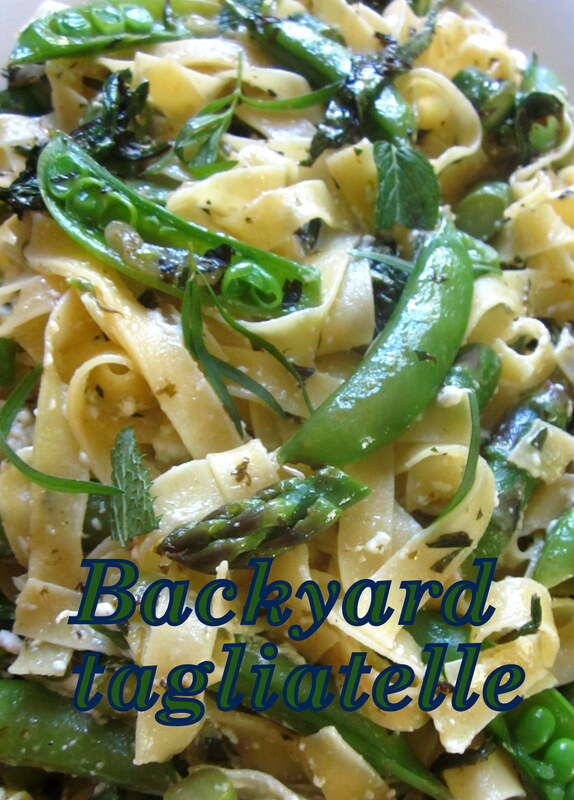 Finish off the plate with a sprinkle of fresh parsley. With gumbo, you do watcha wanna; trying to pin down an exact recipe is like searching for gators in bayou swamp water. The mention of gumbo might conjure up thoughts of shrimp, chicken, and andouille sausage, but the beauty of the catch-all stew is that there are infinite ways to make it your own based on your mood or whatever is fresh or on hand that day. 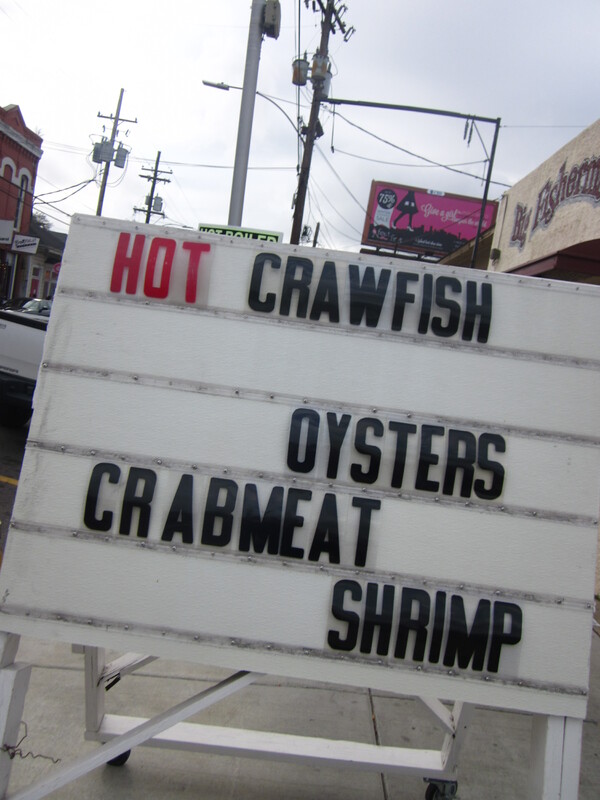 Creole seafood gumbos often include crab or oysters, while versions from Cajun country make use of venison, squirrel, and alligator. And then there’s gumbo z’herbes, a venerable sub-category of its own within the gumbo family. Like the majority of gumbos, gumbo z’herbes uses the “holy trinity” (onion, bell pepper, and celery) as its foundation and Cajun seasoning as its primary spice. 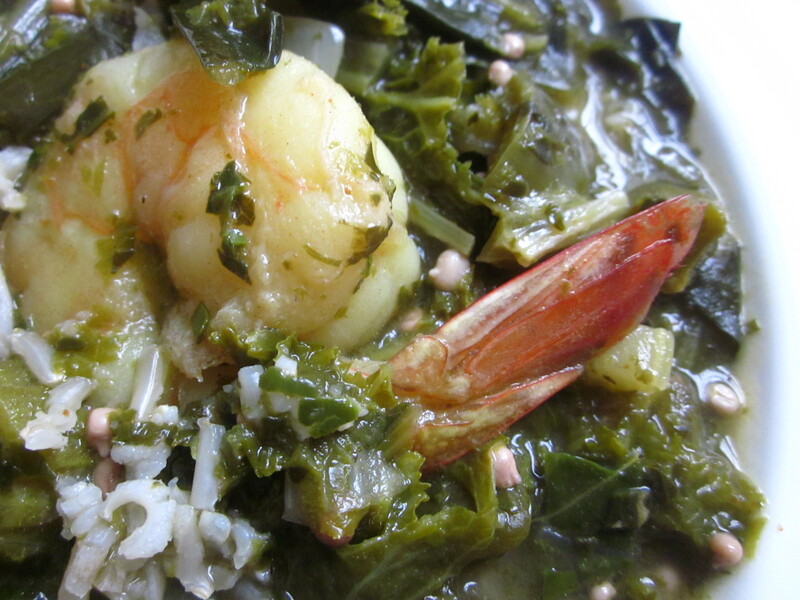 However, as its name – a shortened form of gumbo des herbes – suggests, its main ingredient is a hodgepodge of greens. 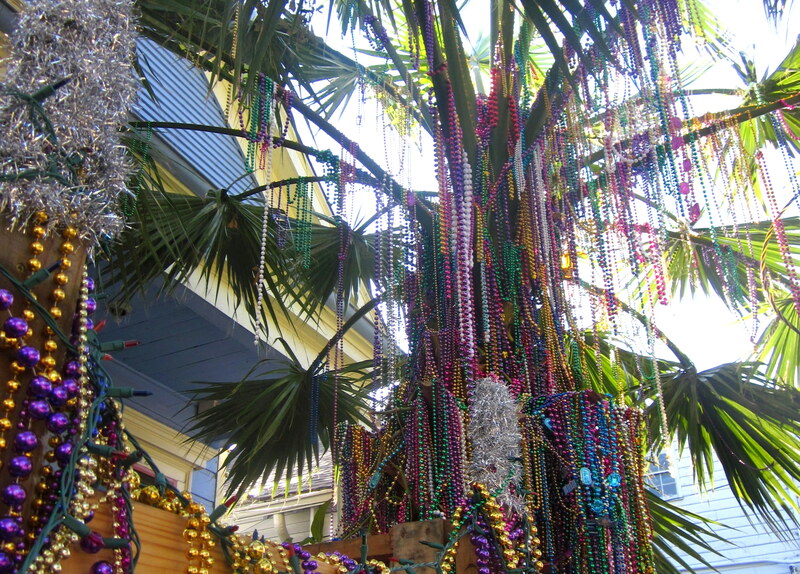 According to Louisiana lore, every green you add to the gumbo signifies a new friend you’ll make that year. This past week, I used collards, mustard greens, curly kale, Lacinato kale, and dandelion greens, but you can use whatever combination of leafy greens you like – spinach, chard, turnip greens, chicory, beet greens, carrot tops, cabbage, sorrel, parsley… Gumbo z’herbes is a kale smoothie I can handle. There are as many different histories and meanings attached to gumbo as there are recipe interpretations. 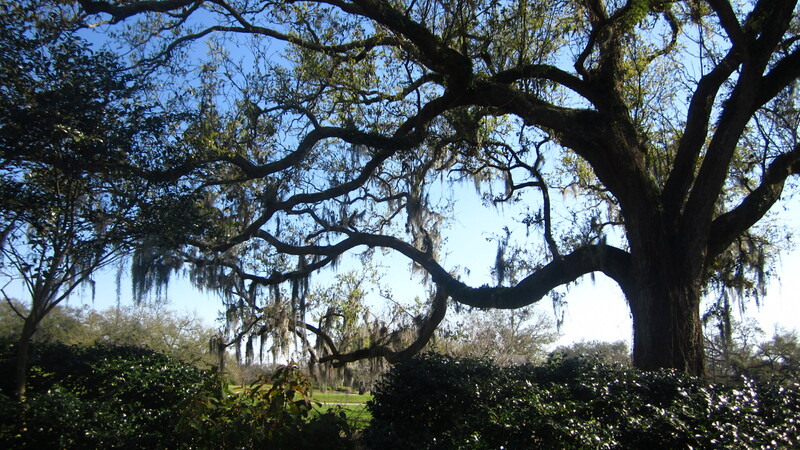 It’s generally agreed that gumbo z’herbes originated as a meal made during Lent. Traditionally, Catholics abstain from eating meat on Fridays in the 40-day period after Fat Tuesday, so some say the gumbo emerged as a meatless alternative that could feed families on these Friday evenings, especially on the main day of fasting, Good Friday. For Leah Chase, chef and owner of the legendary New Orleans soul food institution Dooky Chase, gumbo z’herbes is eaten on Holy Thursday, the day before Good Friday. Her version has seven different kinds of greens matched by seven different kinds of meat, and is meant to fortify its eaters for the day of fasting to come. 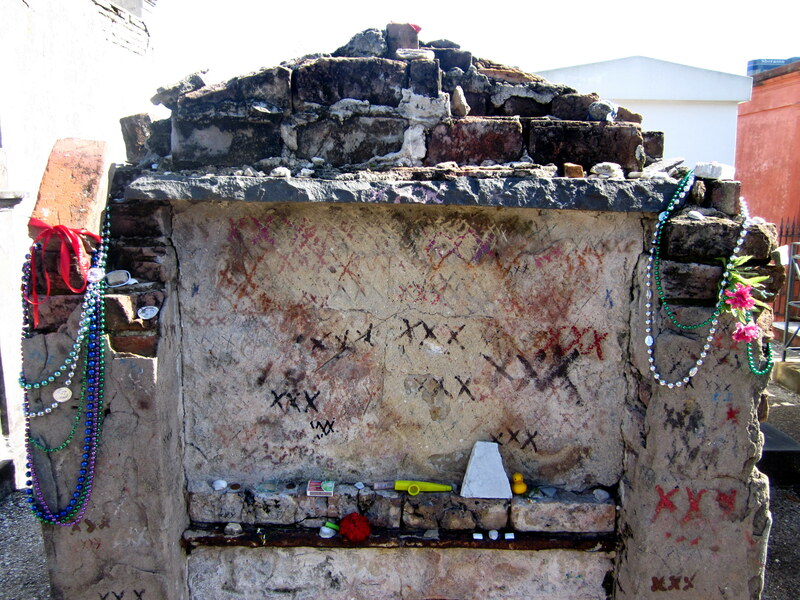 Others claim that nine types of greens should be used to symbolize the nine churches visited by Catholics in New Orleans as part of their traditional Good Friday pilgrimage. Regardless of the day or the exact number, everyone agrees that an odd number of greens should be used to signify good luck. 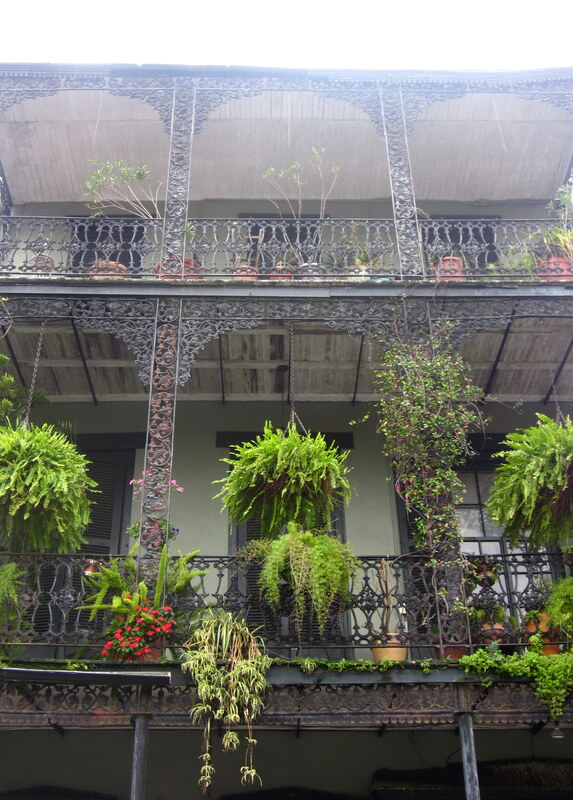 Gumbo achieves its trademark consistency through three different thickeners: okra, filé, or a roux. 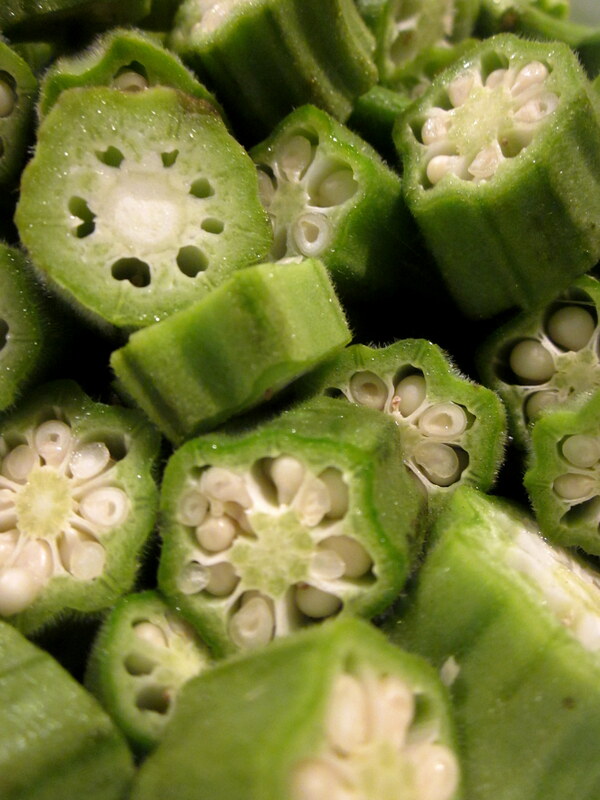 Cooked okra’s slimy texture may be off-putting to some, but it is actually a treasured binder between chopped vegetables and broth. 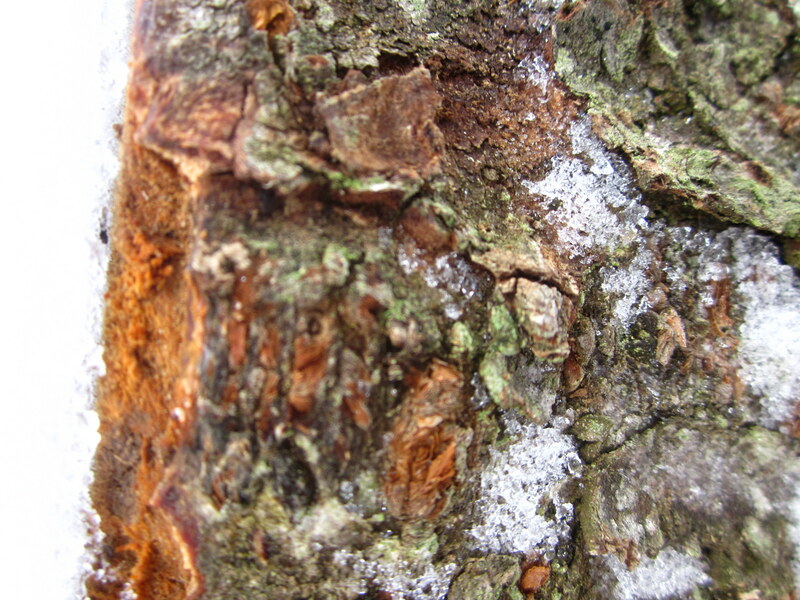 Filé is a powdered form of sassafras leaves, a contribution made by the Choctaw Indians to Cajun cooking, and is added to gumbo to thicken the stew once it finishes cooking, shortly before serving. Roux, on the other hand, speaks to French culinary influence in Creole cooking. In this method of thickening soup, flour is slowly stirred into fat and cooked to either a light or dark brown color. 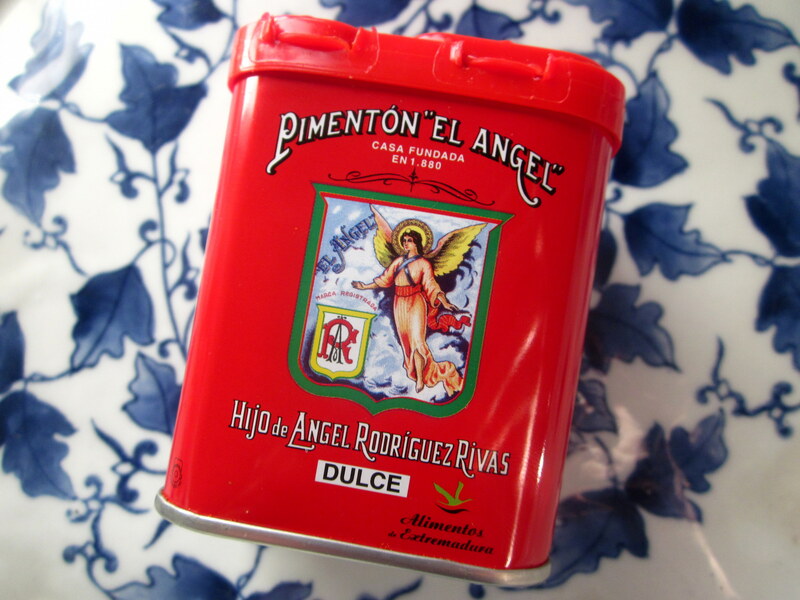 Gumbo z’herbes often calls for filé as its thickening agent. However, in the version of gumbo z’herbes below, which is a combination of different recipes I’ve come across, I make a roux for a base, then add okra for some variety in texture. I also add shrimp, since they liven things up while keeping everything Catholic-friendly. Happy Friday! 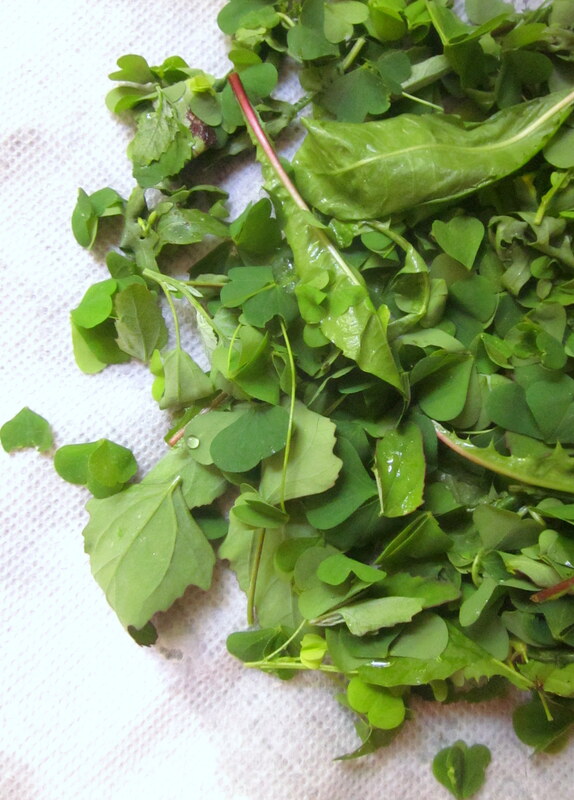 Wash greens, remove any tough stems, and tear into large pieces. Place the greens in a large pot with about 3 cups of water and some salt. Cook over medium-high heat until the water starts to simmer, stirring occasionally, then tightly cover with a lid. Turn down the heat and let cook for about 10-15 minutes. Depending on the size of your pot, you may want to divide the greens in two batches for this step, or add the greens to the pot in stages as they cook down. 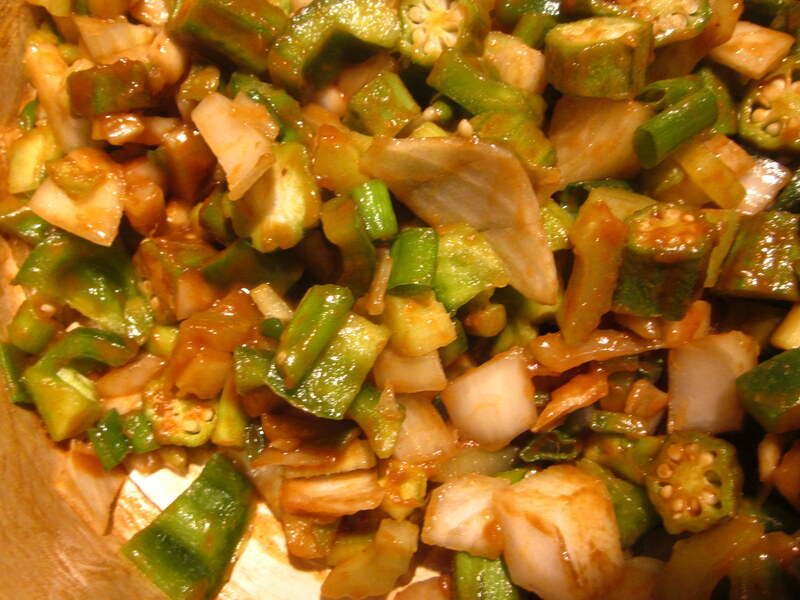 While the greens are cooking, start prepping your other vegetables: dice the green pepper, onion, and celery, mince the garlic, and chop the green onions and okra. 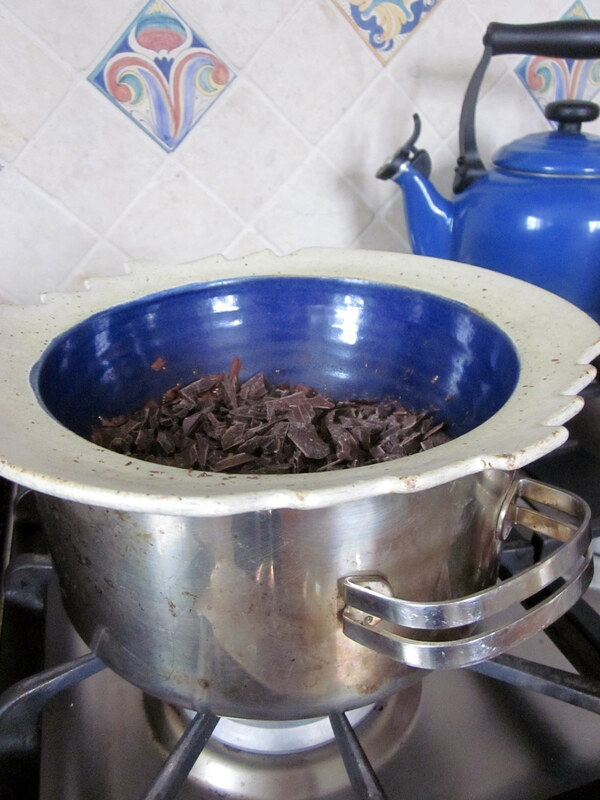 Once the greens have cooked down, put a colander over a large bowl and drain them, reserving all the cooking liquid. Puree half of the greens in a food processor or blender. Chop the remaining half into small pieces and set aside. Make a roux: Heat oil or butter over a medium flame in the large pot. Gradually sprinkle in the flour while stirring continuously with a whisk, taking care to keep the roux from burning. 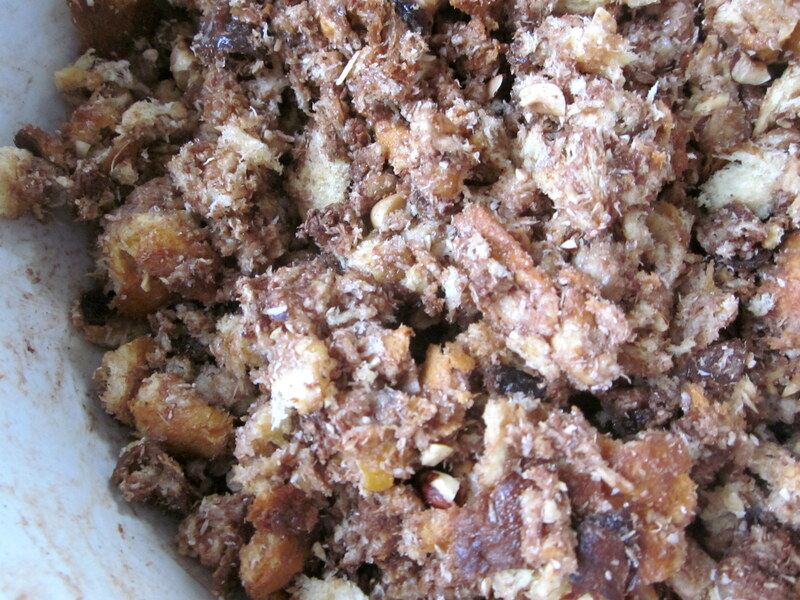 Cook, constantly stirring, until the roux takes on a dark caramel color and smells nutty. If you’re not in a hurry and are looking for an arm workout, cook over low heat for about 45 minutes, armed with a beer in your other hand. 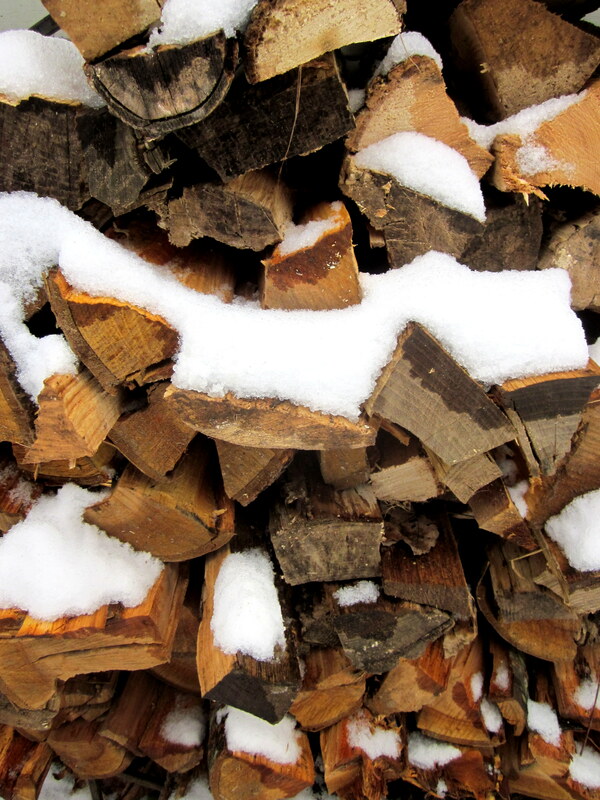 If you’re pressed for time you can cheat by turning up the heat and cooking for about 15 minutes. Once your roux has browned, add the “holy trinity” (onion, celery, and green pepper) to the pot, together with the green onions and garlic. Cook over medium-high heat for about 5 minutes, stirring often. When the onion begins to turn translucent, add the okra and Cajun seasoning. Continue to cook, turning down the heat slightly, for 10 minutes or so, letting the vegetables brown. Add 3 cups of water and the reserved liquid from the greens to the pot, followed by the pureed and chopped greens. Turn up the heat and bring the gumbo almost to a boil. Add the bay leaf, cloves, and allspice, along with salt and pepper to taste, and stir well. Reduce the heat to a low simmer and let cook for about an hour or longer, stirring occasionally. When you are about ready to serve, add the shrimp and let cook 5-10 minutes. Serve the gumbo in a bowl over a bed of rice. For an extra spicy and vinegary kick, add some Green Tabasco. When I’m snowed in, one of the meals I crave most is the rabbit my grandpa would cook when I visited him in Piedmont during winter. The skillet of rabbit he would bring to the table may have looked humble compared to a whole roast chicken or slab of brisket, but it was full of flavor, tasting like the chestnuts the animal would feed on throughout the fall. 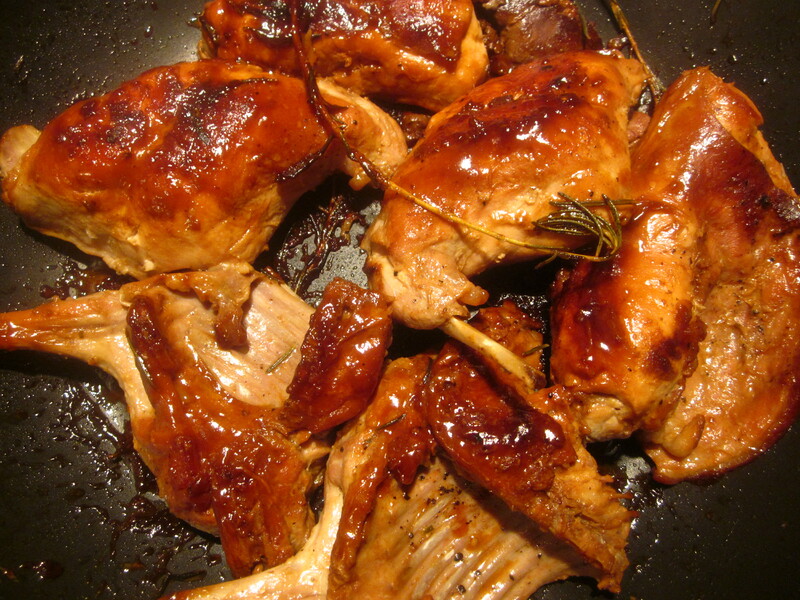 Arguably the most popular and widespread version of rabbit in Italian cooking is coniglio arrosto, which translates to “roasted rabbit.” Technically, the meat is braised rather than roasted, meaning it is initially seared over high heat, then simmered slowly with small amounts of liquid – a way of cooking meat that allows it to remain juicy as it develops an irresistibly caramelized skin. 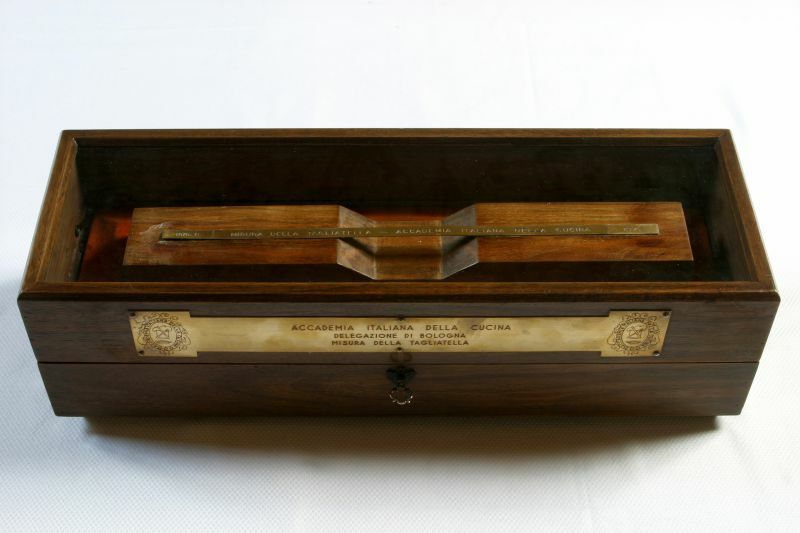 Each region of Italy is associated with its own unique embellishments to coniglio arrosto, depending on the availability of specific seasonal ingredients and the characteristic foods produced within the area. In Liguria, for example, the meat is typically prepared with black olives, one of the main products of the coastal region. At the foothills of the Alps in Piedmont, where corn is plentiful, coniglio arrosto is often served alongside polenta or, in the spring months, lightly sautéed sweet peas. Regardless of the variations between different regional adaptations, coniglio arrosto, with its rustic informality, is an expression of the value of simplicity and making use of readily available ingredients. 1. Heat olive oil in a skillet with the garlic. Add the rabbit, seasoning the exposed side with salt and pepper. Sear over high heat for about 5 minutes, until browned. Turn, seasoning the other side, and cook for another 5 minutes or so. 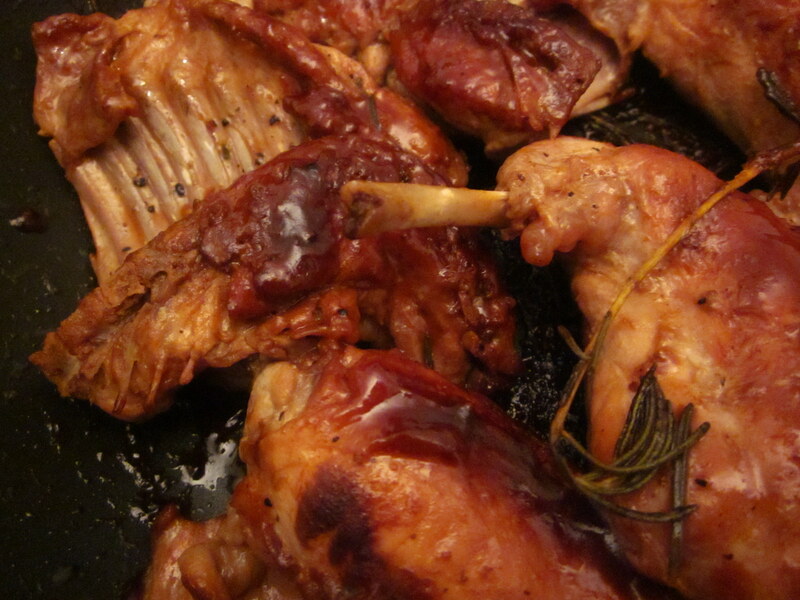 Depending on the size of your pan, you may want to sear the rabbit in two batches to avoid overcrowding the pan. 2. 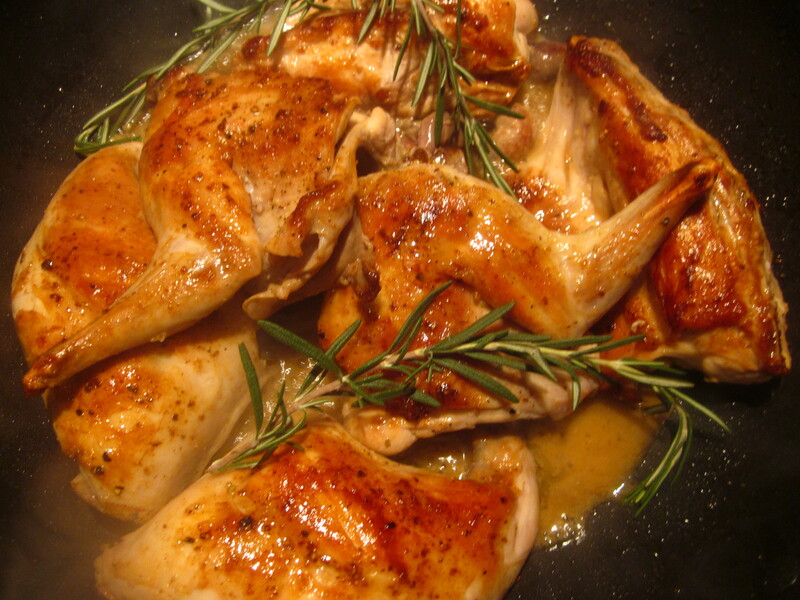 Add white wine and rosemary sprigs, then cover the pan and simmer for 45 minutes to an hour. Once the wine has been absorbed, add about 1/4 cup water. 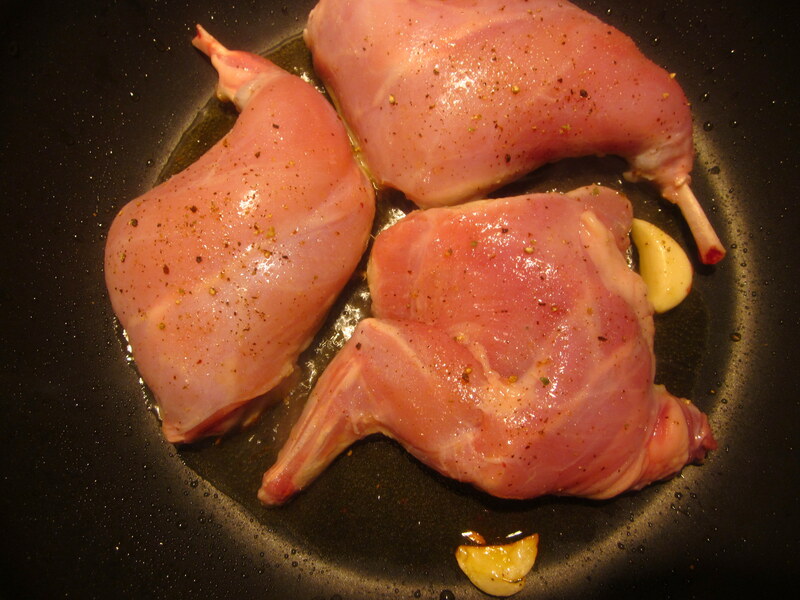 Continue to check on the rabbit to see when the liquid has been absorbed, adding 1/4 cup at a time when the pan is dry. 3. When the rabbit is almost done (fork-tender), continue cooking without the lid for about 10-15 minutes, until all the liquids are absorbed. On a snow day, serve with polenta. Smell, it’s said, is our most powerful sense. Just one whiff can transport us through time and space, bringing to life those experiences archived back in the deep recesses of our memory – a departed grandparent’s cooking, an exotic meal from faraway travels, our first childhood encounter with a strange and exciting fruit. 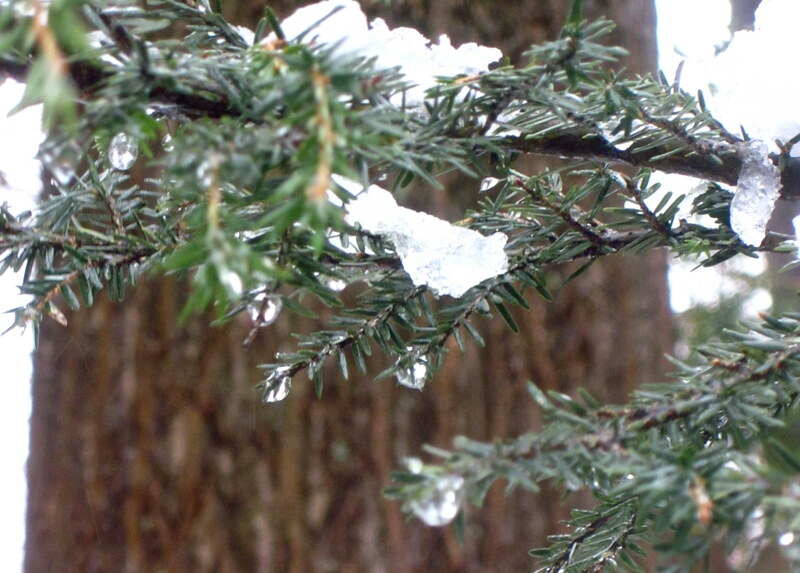 In the gray days and ice storms of winter, the smell that I find most powerful is that of fresh oranges. I’m thinking about that moment when you first break through the peel; a bright burst of citrus suddenly hits the air and color seems to come streaming in, gradually diffusing throughout the room. 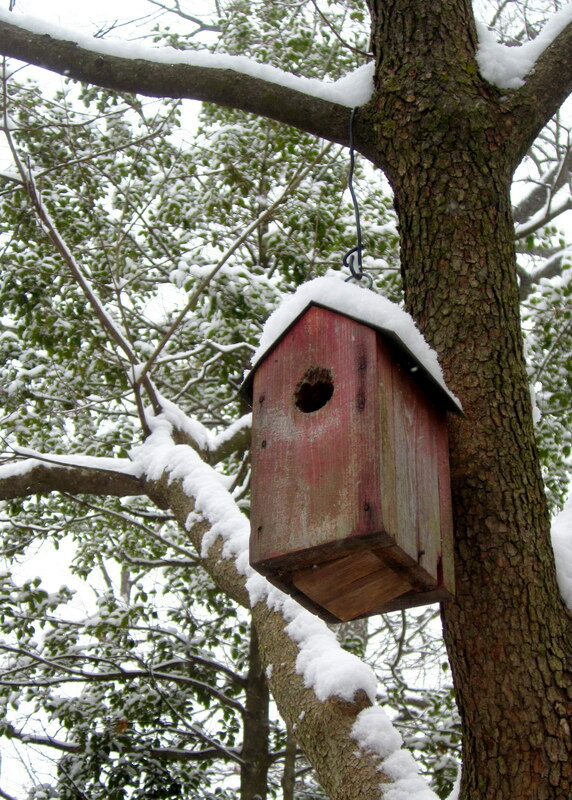 Nature has a funny way of giving us what we need just at the right time. That’s exactly the joy of seasonal eating, the fact that the bounty of citrus in the U.S. overflows at the very point of the year when we desperately crave sunshine. 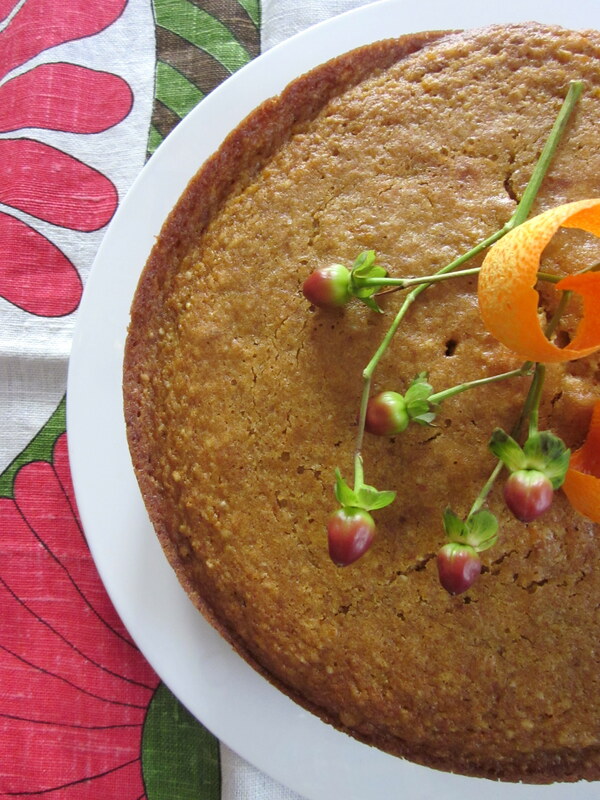 Lately I’ve been getting my fix with a recipe for an aromatic orange spelt cake. It’s a humble little dessert (or breakfast item), almost like a cornbread, but with uplifting notes of citrus – and it also happens to be sugar and dairy-free. Preheat oven to 350°. Grease a baking pan (springform, loaf, bundt – whatever tickles your fancy) with olive oil. Roll the oranges on the countertop with the palm of your hand – it will break open some of the “juice pockets” (that’s my technical term for membranes), making it easier to squeeze all of the juice from the fruit. Zest the oranges before cutting them in half and juicing. 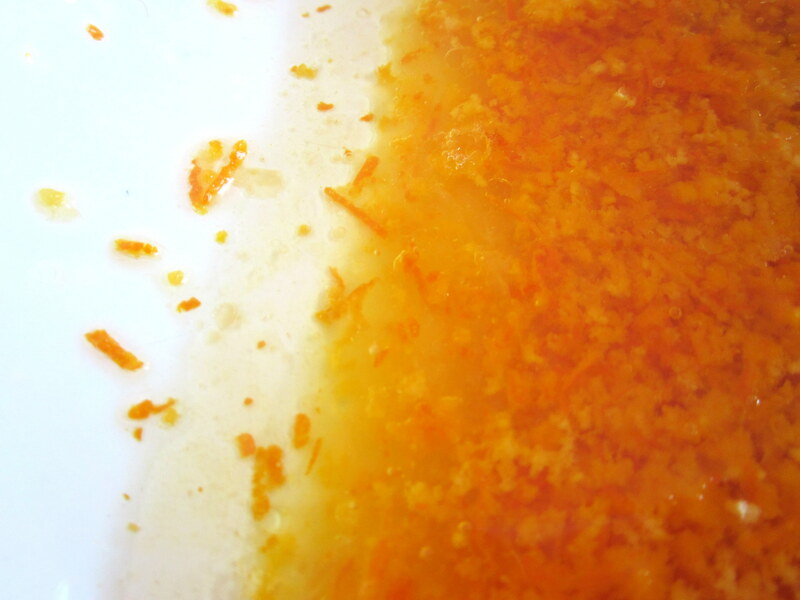 In a large bowl, stir the zest and juice together with the sunflower oil and maple syrup. 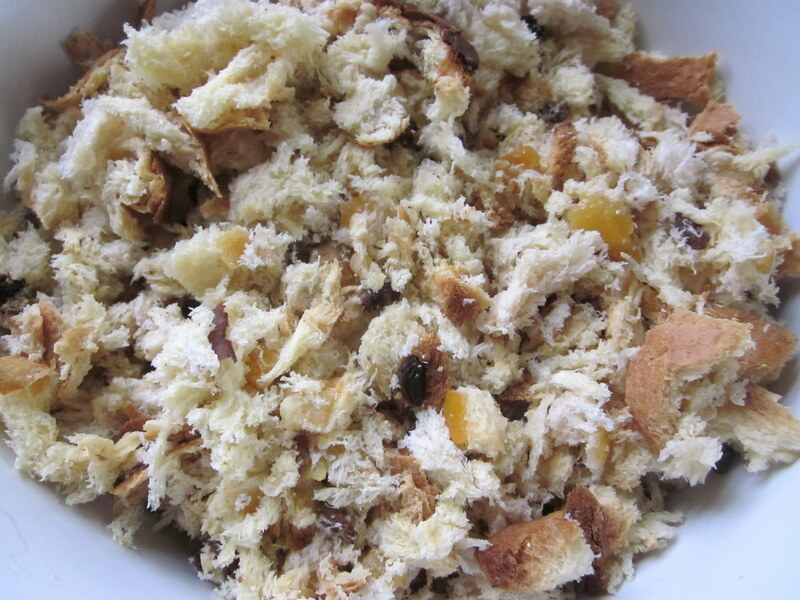 In a smaller bowl, combine the dry ingredients (spelt flour, ground almonds, baking soda, and salt), then fold into the wet mixture, stirring in the raisins at the end. Pour the mixture into the pan and bake for about 40 minutes, or until the top turns golden brown and a toothpick comes out clean. 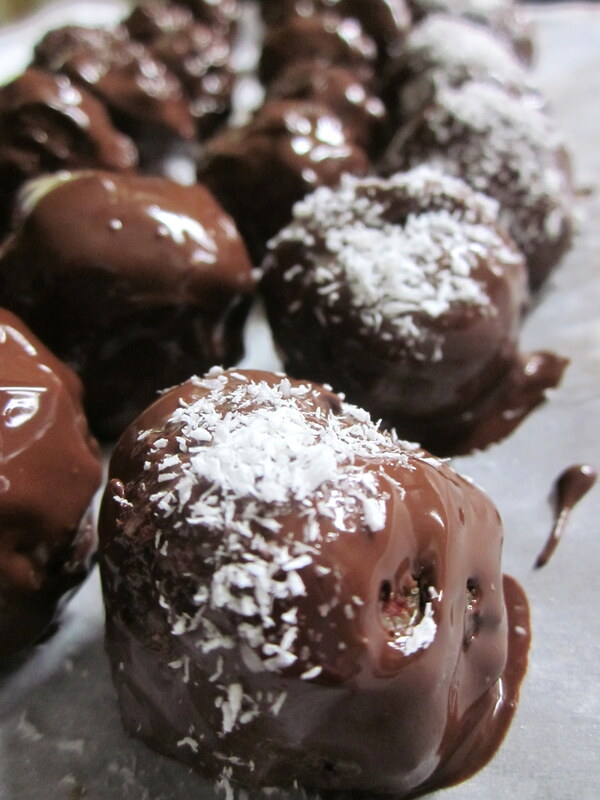 If the top colors before the inside sets, cover with aluminum foil for the remaining time in the oven. Where else can you find a family-owned Italian cafe, a hipster cocktail lounge, Hasidic Jews walking to synagogue, and a mechanical bull all in the same 5-block radius but Montreal? The city is an ideal blend of North American and European style, spiked with colorful multicultural flair and feisty Quebec nationalism – the perfect conditions for a thriving food and nightlife scene. So when my close college friends and I spent this past weekend in the city, it was pretty much an excuse to revisit our old haunts, trying to fit as many foods and drinks as humanly possible in a 48 hour window. It’s all a blur of Le Cendrillon cheese spreads, local rabbit, bagels and lox, ducks-in-cans, PEI oysters, maple syrup cheesecake, brunch upon brunch… If there’s one place where excess reigns supreme in the middle of winter, it’s Montreal. Thanks to my friend Lauren for having the wherewithal to capture this moment at La Banquise amidst fierce fork battling. Ask an American where the sacred provenance of the bagel lies, “New York City, of course!” will be the answer. Ask a Canadian? Entirely different story. Just across the border, the bagel is often included among iconic Canadian foods and is occasionally referred to as a national treasure. But, unlike the ubiquitous Canadian bacon and maple syrup, Canada’s bagel allies itself more with the Quebecois city of Montreal and its Jewish neighborhoods than the whole country. The very name of the prized baked good attests to this specific loyalty – it has been christened the “Montreal bagel” or “Montreal-style bagel” rather than the “Canadian bagel.” Just as (and, to a certain extent, because) it is difficult to reach agreement on the exact history of the iconic food, it is difficult to determine its exact cultural territory. It frequently finds itself at the center of what is often referred to as “bagel wars,” in which bagel appassionatos attempt to stake claims to the baked good and define what it means to be authentic. Strangely, the Montreal bagel serves as a point of unity and contention among native Montrealers, as citizens join together to fortify their defense against outer threats to the integrity of their city’s bagel. But they are also divided by the internal disputes rooted in the rivalry between the city’s two main bagel factories and, on a more symbolic level, the bagel’s ethnic identity. For the most part, Montrealers believe making their bagels at home is almost impossible, so the popular conception surrounding their production is that they must be made at special bakeries committed to the traditional method of wood oven baking and honey-water coating (as opposed to the New York version made with salt, boiled in plain water, and baked in a standard oven). In particular, Montrealers champion the Fairmont and St-Viateur bagel factories as the two long-standing locations where the “true” bagel is produced according to the method introduced by Jewish immigrants, and dismiss any other reproductions as inferior knock-offs. Both bakeries are resistant to the notion of standardization, since no two of their hand-made bagels are the same. Though the exact details of its history both abroad and within Montreal are contested, it is agreed that bagels originate from the Jewish enclaves in the Old Country of Eastern Europe. The introduction of the bagel to Montreal through the early establishment of the Fairmount and St-Viateur bakeries, respectively launched in 1919 and 1957 by Jewish entrepreneurs, is generally rooted in the heavy influx of Jewish immigrants who brought their traditional bagel-making technique from Eastern Europe to Montreal during the late nineteenth century, and the consequential development of one of the most traditional Jewish communities in North America. 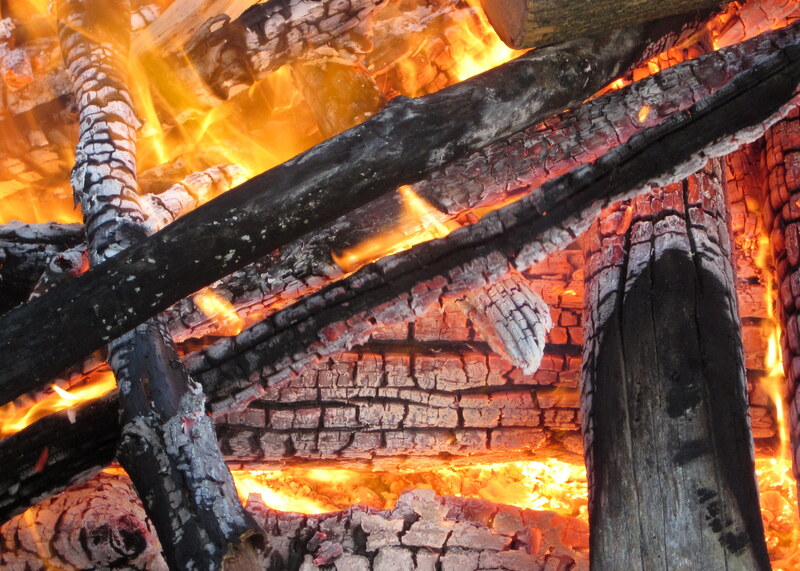 Montreal’s relatively lax fire code is also cited as a reason for the bagel’s success in the city, since the characteristic wood-burning ovens which ensure the singularity of the Montreal bagel are banned in other cities. Nurtured by a thriving immigrant Jewish community and less stringent regulations, Fairmount and St-Viateur bagel factories were immediately associated with their home city, as they were named after Mile End neighborhood streets rather than their parent Jewish families. 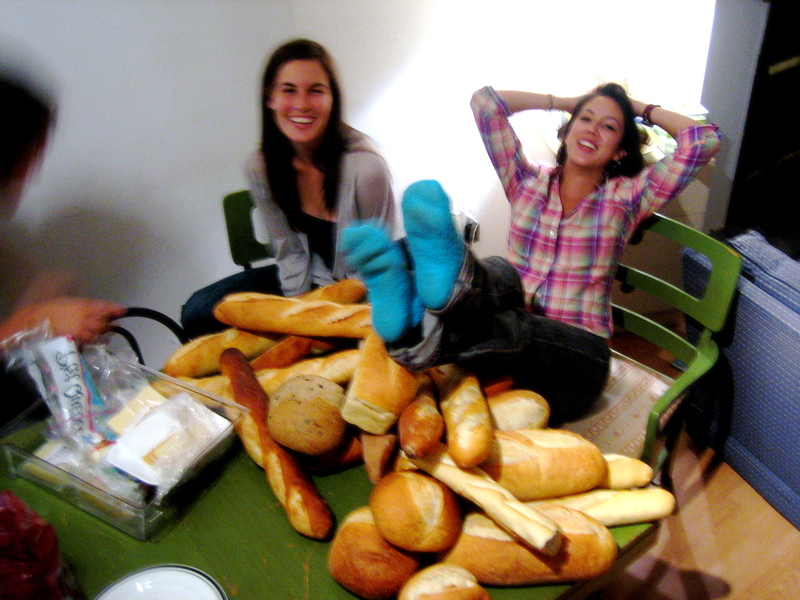 Staking a claim to the baked good, native Montrealers often use a territorial rhetoric when discussing the bagel. 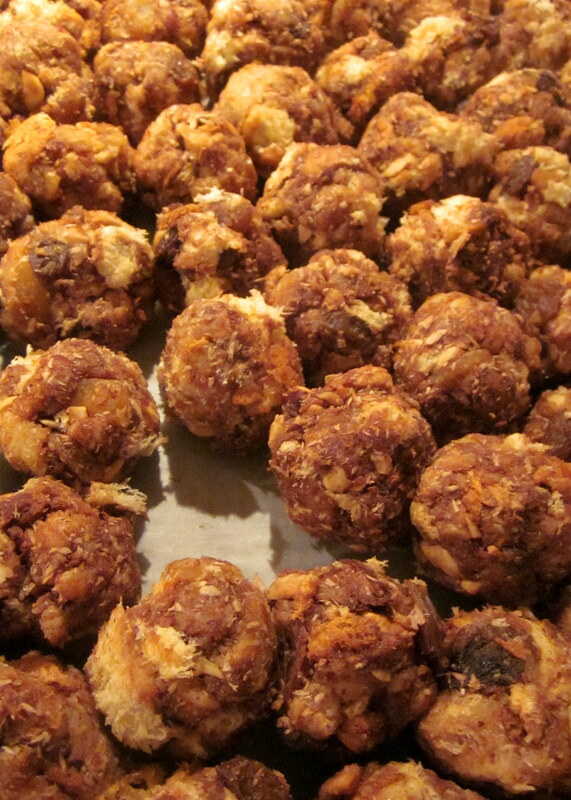 The Gazette, for example, refers to the baked good as “ours,” declaring to Toronto: “You’ve got the banks. But we’ve got the bagels.” The Montreal bagel helps unify city natives under a broad, common identity, cursorily patching the divide between Francophone and Anglophone culture. Both bagelries were established by Jewish immigrants of Eastern European origins. Fairmount is very much a family operation: everything must meet founder Grandfather Isadore’s standards, and the bakery remains distinctly family business. In contrast, St-Viateur is now owned by Joe Morena, a Southern Italian immigrant whose 45 years of experience makes up for the lack of Jewish family ownership. Purist Montrealers remain staunchly dedicated to whichever bagelry they see as most genuine, and, in either case, the bagel signifies a loyalty to old-school Montreal culture. 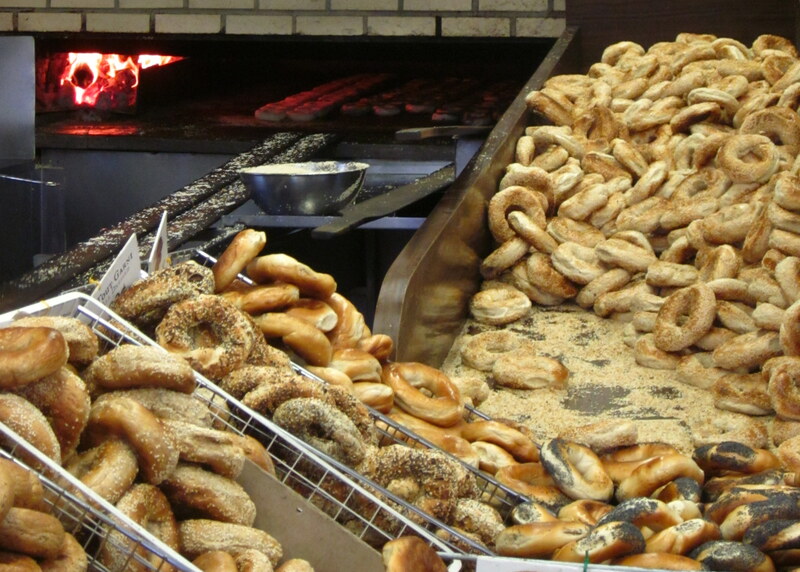 Inside Fairmount Bagel – what to choose? The degree of association of the Montreal bagel with Jewishness is also a point of contention. Together with smoked meat, the bagel is a distinct product and signifier of Jewish Montreal – tellingly, the Fairmount bagelry includes matzo bread on its daily menu. But Montreal’s Jewish community has severely shrunk since the 1970’s, giving way to increasing Portuguese influence in the Mile End neighborhood, where the local synagogue is now a Portuguese community center. The insistence on sponsoring the authentic Fairmount and St-Viateur bagelries, and, by extension, the traditional methods they embrace, speaks to an agenda of conservation involving the Montreal bagel. The bagelries have become sites of pilgrimage where nostalgic patrons can get a taste of the old Jewish Montreal they used to know. The Montreal bagel doesn’t solely appeal to those of Jewish descent, though. You are just as likely to come across a hockey jock standing in line for his order at St-Viateur after a night of drinking, since the bagelries are open until the wee hours of the morning. 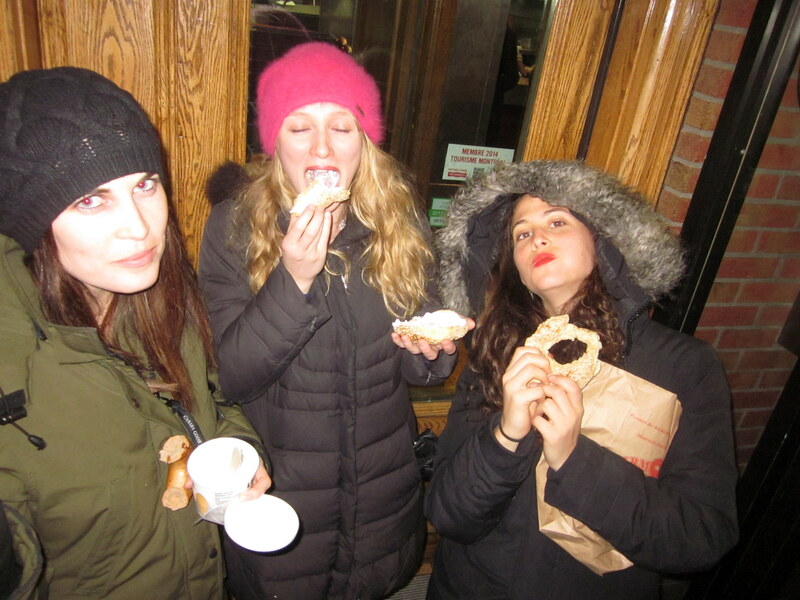 Case in point: 3am bagel run. Interestingly, bagels are very popular amidst the French-Canadian population of Montreal, even though the history of their relationship with Jewish immigrants has been fraught with strife. French-inspired embellishments to the bagel – bagel with feves au lard, bagel with les frites, bagel with les oignons ronds – abound in neighborhood restaurants and cafes, and some people take issue with what they see as a Quebecois appropriation of Jewish culture. 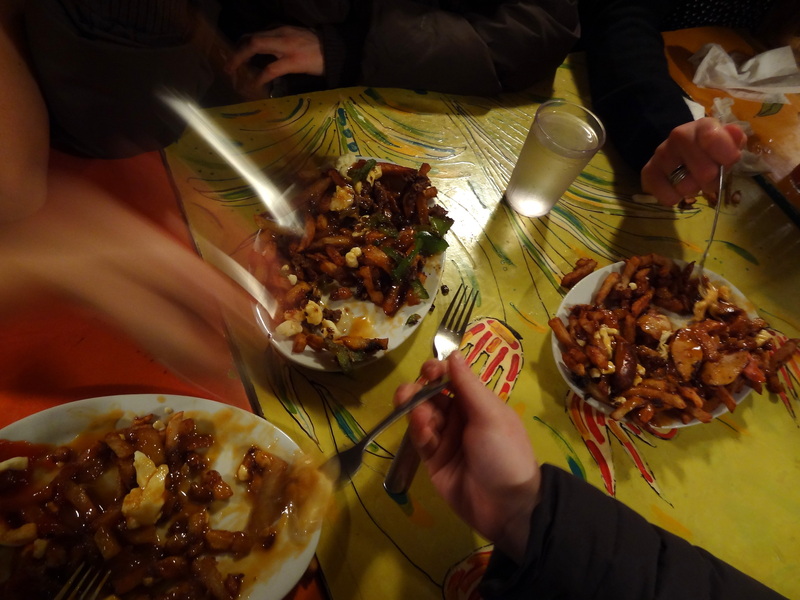 Will the Montreal bagel join poutine in the ranks of traditional Quebecois food? As McGill University sociologist Morton Weinfeld puts it, “It is not clear whether Francophones register that deli is something Jewish. It’s an adopted cultural item. They can be eating smoked meat and completely disassociate it with Jews. Jews are the crazy ones in black hats, les maudits juifs, and they’ll say it while eating a smoked meat sandwich.” With regards to the bagel, it seems ethnicity can be hard to digest. Native Montrealers, Jewish and non-Jewish alike, share a commitment to the traditional method of preparation that distinguishes their bagel from its puffier New York counterpart. 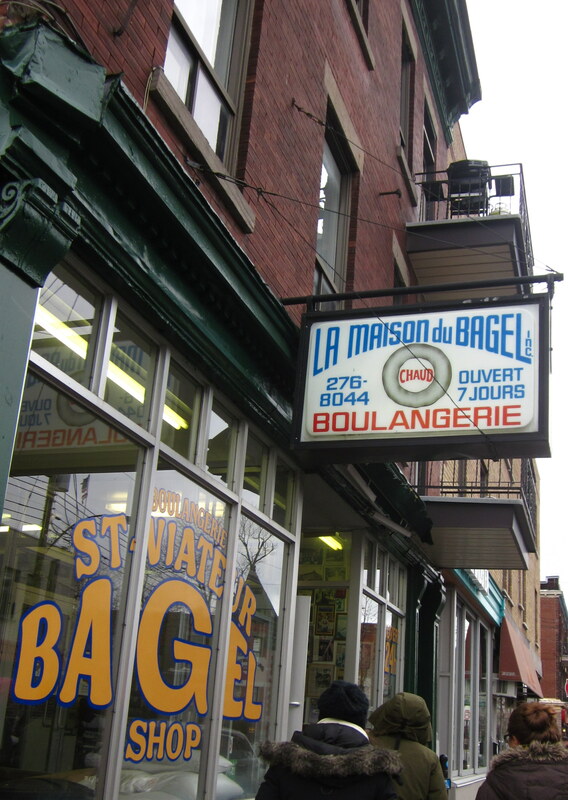 Although it offers Montrealers an opportunity for unity, the masking of the bagel’s Jewish history in favor of a cohesive Montreal identity can be problematic. Ultimately, though, the Montreal bagel’s lack of fixed territory gives it the promising potential to be a bagel of many tastes.